Fenway Park, 1936 or 1937, and Washington Senators’ John Stone poses for the camera of Leslie Jones of the Boston Herald-Traveler. Stone was an accomplished outfielder with speed and a strong arm, but also with some offensive prowess, first for the Detroit Tigers and then the Senators, a steady RBI man despite limited power but more impressively batted .300 or better in no less than 7 seasons, with a career BA of .310. Stone seemed to skirt everlasting fame due to bad luck in varying forms: Coming up and playing for Detroit from 1928 on, Stone had good years for the otherwise second-division Tigers, including some MVP votes in 1931; his reputation was such that the rising Senators hoped to lure Stone to the nation’s capital for 1933 – Detroit declined, but Washington nonetheless won the AL pennant that season, with Stone missing out on the closest chance for postseason play in his career to that point. 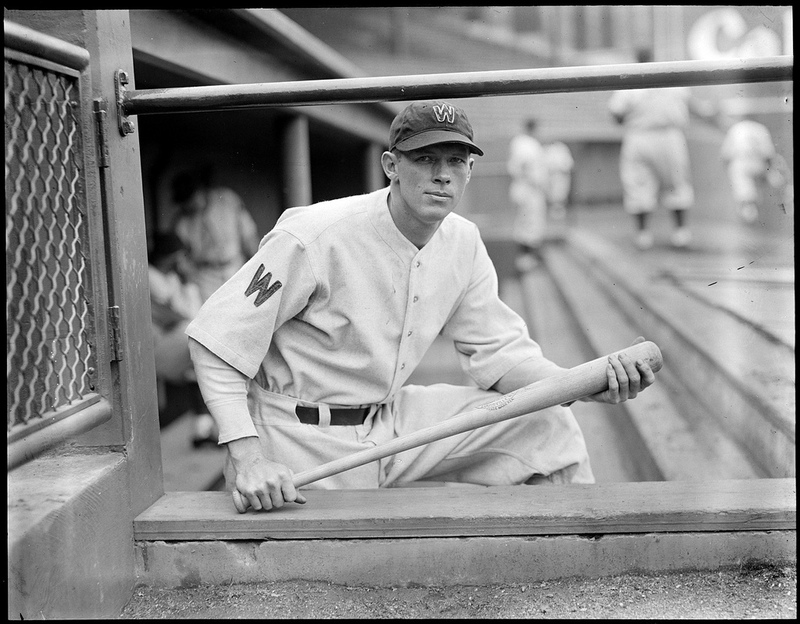 Undaunted, Washington tried again to trade for Stone the following season, this time offering power-hitting lefty Goose Goslin, and Detroit was sold, swapping Stone for Goslin straight up. It was a savvy switch for the Tigers, who reversed their fortunes with Goslin and won both the 1934 and 1935 AL pennants and the 1935 Championship, with now the Senators and their new outfielder in tow slipping back in the standings, and Stone again denied chances for the playoffs – he would never participate in the postseason in his career, contributing to limiting his exposure on a national level. More unfortunate for John Stone, while continuing to put up strong numbers for the Senators, was the emergence of an unknown ailment in 1938; physical weakness and deteoriation led to a club-ordered physical exam, revealing a troubling diagnosis, especially for that time: tuberculosis. Owner Clark Griffith generously paid the rest of the popular player’s salary for the season soon after, but in those days such an affliction resulted in a long and less-than-assured road back to general good health, and, despite a strong recovery by spring 1939, doctors advised that resuming the rigor of a baseball career could still be hazardous, and Stone reluctantly retired, at age 32. The team again showed its appreciation by having a John Stone day at Griffith Stadium, with Detroit the visitors, on September 17, 1939. Sadly, perhaps with lingering effects of this lengthy illness, Stone would die prematurely at age 50 from a sudden heart attack. Stone, above, is nicely captured by Leslie Jones – well composed and framed by the visiting dugout at Fenway Park. While Jones wasn’t exclusively a sports photographer, his collection of over 2,500 baseball photos taken in both Boston major league parks in the 30’s, 40’s and 50’s are of exceptional quality and an essential contribution to the history of the sport (rivaling the legendary Bain collection in my opinion); thankfully they were donated to the Boston Public Library and digitized, and are publicly available for all to see and enjoy, and I encourage any classic baseball fan to do so. Finally, the great portrait above of John Stone – stoic, sober, purposeful, and sporting an ever-present bat – may indeed be among the best representations of what that long ago sportswriter referred to as a “ballplayer’s ballplayer”. Thanks, I’m glad you enjoyed it, and thanks for the interesting info. Just loved that portrait of him by the great Leslie Jones, and Stone has been woefully underrated; if not for some bad luck he would be more widely known today.